This adventure is specially designed for play by drow characters, but can be used with any adventuring party. Pregenerated drow characters are included. The characters are commissioned by a drow housemistress to acquire a mysterious weapon known to be in the hands of her enemies. Locating, identifying, and acquiring the magical weapon leads them on a great trek across the underdeep, where they must battle svirfneblin, a powerful lich, and enemy drow. 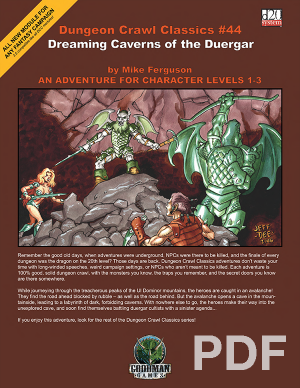 Dungeon Crawl Classics can be integrated easily with any fantasy setting. 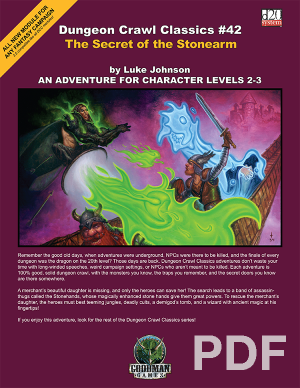 If you enjoy this adventure, you might also enjoy the rest of the Dungeon Crawl Classics series. Four separate episodes with almost 60 keyed encounter areas that send the PCs against a variety of opponents. Stats for two new underdeep monsters, plus new information on svirfneblin and their strange firearms. 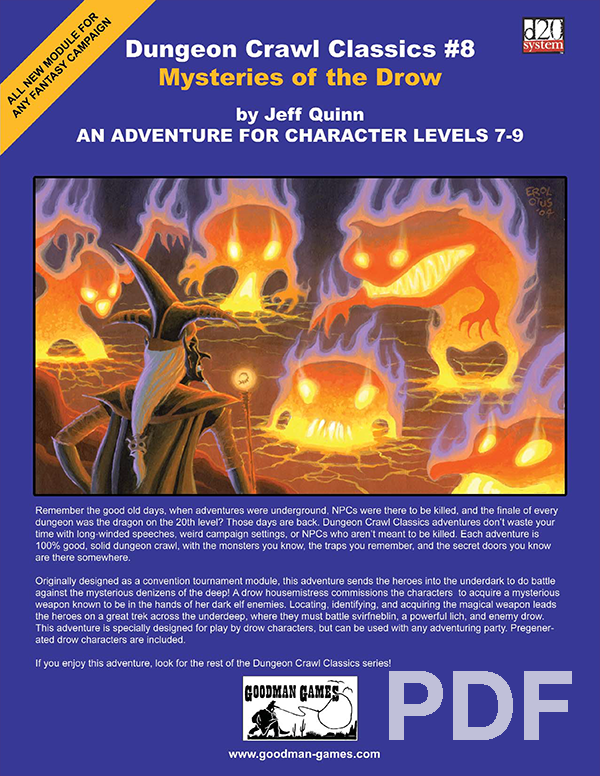 A variety of player handouts, including a special prop (the first for the DCC series) to be constructed by the DM prior to the PCs’ encountering one of the lich’s devious puzzles. 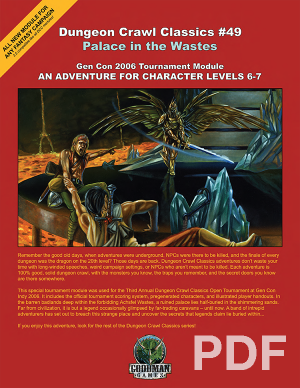 Complete stats for 6 pregenerated drow characters, including a recap of drow special abilities should the DM wish to run this adventure with drow PCs.This module was first run as a 3-round convention tournament event at Running GAGG: Psi Phi Nut in Geneseo, NY, February 2003. For more information on the convention, visit http://gagg.geneseo.edu/. If you enjoy this adventure, you might enjoy our sourcebook Complete Guide to Drow. 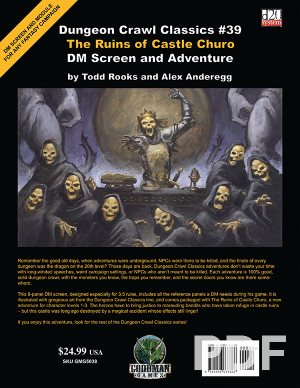 Written by the same author as DCC #8: Mysteries of the Drow, it expands on many of the themes presented in the module, as well as offering extensive new material. Also be sure to look for the rest of the Dungeon Crawl Classics line! This is only one of many great adventures, such as DCC #5: Aerie of the Crow God, which was nominated for Best Adventure in the 2004 ENnies.